Over the past few weeks, cities across Canada have evicted Occupy protesters from camping overnight in public parks. Opinion remains divided over the tactics of the amorphous movement. One lawyer recently defended the group by arguing in court that the occupation of Toronto’s St. James Park was a “physical manifestation of the exercise of … conscience.” In other words, the medium is the message. But some residents living in the area expressed that they felt threatened, and local businesses complained about a loss in revenue. A Toronto judge ruled that the reasonable limits clause of the Canadian Charter of Rights and Freedoms overrides the protesters’ particular means of freedom of expression. Last Wednesday, police evicted the final protesters from the park. The use of public space for political protest has a long and contested history in Canada. 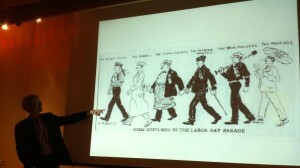 Historian Craig Heron recently presented a timely talk entitled “Labour on the March: 150 Years of Labour Parades in Toronto.” He began his presentation by pointing out the Occupy movement’s uses of the street. For example, protesters in Toronto had used their bodies to form a “99” (as in “99 percent”) at the intersection of Yonge and Dundas Streets while media helicopters hovered above. People move through streets to communicate a message, Heron argued. Historically, parades have been an “extremely important form of mass communication,” and it was one way in which labour demanded respect within wider Canadian society during the nineteenth and twentieth century. 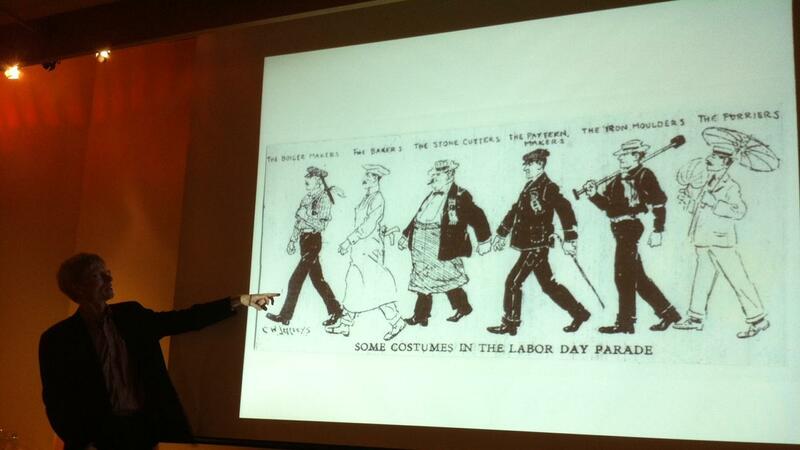 Heron’s talk comes from research for his 2005 book The Workers’ Festival: A History of Labour Day in Canada, which he co-wrote with Steve Penfold. The talk is available here for audio download. The presentation was part of the 2011 History Matters lecture series, which gave the public an opportunity to connect with working historians and discover some of the many and surprising ways in which the past shapes the present. This year’s talks focused on two themes: labour and environmental history. Some of these presentations are now available in our podcast section. Stay tuned for recordings of subsequent talks from the series.